The Raygun Gothic Rocketship is a 40 foot retro-future rocket ship model created by Sean Orlando, Nathaniel Taylor, David Shulman. For those unable to climb aboard in person, Almost Scientific has created a stately and elegant scale model. 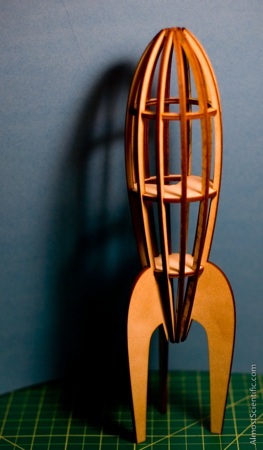 It’s laser cut from 1/8″ ply wood, 13″ tall, and ships flat in a envelope! Yours for $100 in the Boing Boing Bazaar at the Makers Market. This entry was posted on Wednesday, March 10th, 2010 at 3:00 pm	and is filed under Press & Publicity. You can follow any responses to this entry through the RSS 2.0 feed. You can leave a response, or trackback from your own site.